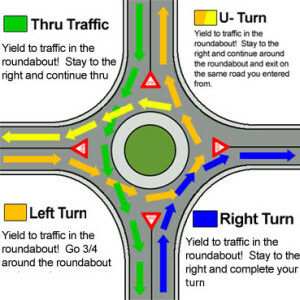 The Insurance Institute for Highway Safety, an independent research group, estimates that converting intersections with traffic lights to roundabouts reduces all crashes by 37% and crashes that involve an injury by 75%. At traffic lights the most common accidents are faster, right-angled collisions. These crashes are eliminated with roundabouts because vehicles travel more slowly and in the same direction. Also, one national study of ten intersections that could have been turned into roundabouts found that vehicle delays would have been reduced by 62-74% (nationally saving 325,000 hours of motorists’ time annually). Moreover, because fewer vehicles had to wait for traffic lights, 235,000 gallons of fuel could have been saved.